Franklin Tomorrow is now competing in A Community Thrives, part of the USA TODAY NETWORK, a fundraising program on CrowdRise by GoFundMe. A Community Thrives is a nationwide program that is focused on helping organizations by shining a national spotlight on their community building initiatives. Franklin Tomorrow has the opportunity to be awarded up to $1 million in available project-based grants to help fund On the Table 2019. Franklin Tomorrow is a community visioning organization, founded in 2001, which has as its mission to engage the community, foster collaboration, and advocate for a shared vision for the future of Franklin. In Fall 2018, Franklin Tomorrow launched On the Table, a new community engagement initiative with a simple premise: an opportunity for people to gather in small groups around a table with friends, neighbors, colleagues and maybe even a few people meeting for the first time, to share a meal and have a real conversation about what’s important to us. “We learned so much about our community and those who live, work and play here through the inaugural On the Table process, but we certainly heard they want to keep the conversation going,” said Mindy Tate, Franklin Tomorrow Executive Director. “As we prepare to release a final report from the process and the more than 400 surveys completed during On the Table 2018, we are also working on the process for 2019. A Community Th rives launched on CrowdRise by GoFundMe on Monday, March 18th, 2019, at 11 a.m. and will continue through Friday, April 12th, 2019 at 10:59:59 a.m. The organizations in tier 1 and tier 2 that raise the most during the program will each be awarded a $25,000 grant, second place organizations will each be awarded a $15,000 grant and third place organizations will each be awarded a $10,000 grant. Weekly bonus challenges enable organizations to be awarded up to $50,000 in grants in each Tier. 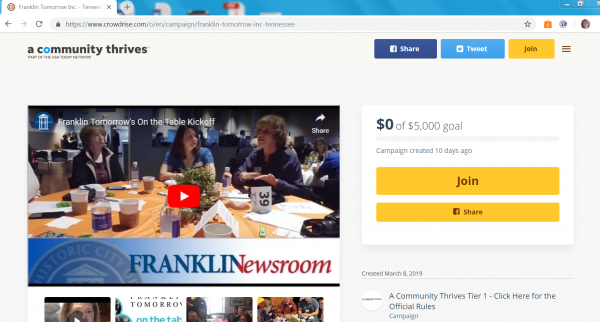 To help Franklin Tomorrow be awarded A Community Thrives grant, visit https://www.crowdrise.com/o/en/campaign/franklin-tomorrow-inc-tennessee. At the end of the crowdfunding period, an additional 16 grants totaling $800,000 will be awarded to participating organizations. Plus, qualifying organizations that provide services in USA TODAY NETWORK’s 109 newspaper markets may be eligible to receive an additional operating grant from a $1,300,000 fund. Franklin Tomorrow engages the community through a series of activities and events, including its quarterly Breakfast With the Mayors and monthly FrankTalks lecture series.